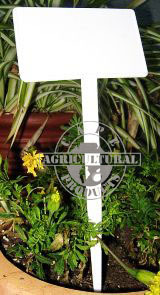 Cape Agricultural Products has a range of items to assist nurserymen, farmers and keen home gardeners to label or mark their products. The range includes self-tie labels manufactured from different materials, aluminium labels, T-Markers, pot labels and many more. This marker has a header board that is angled backwards to make it easier to view the text on the board without having to bend down. We have also re-designed the spike, making it stronger and also strengthening the point where it attaches to the header board, as can be seen here. Use for marking nursery and orchard rows, individual plants and trees and also for marking demarcated stands at open air events. 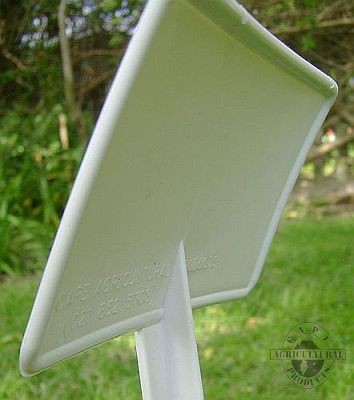 Also used in the florist industry for indicating prices and names of flower bunches in buckets. 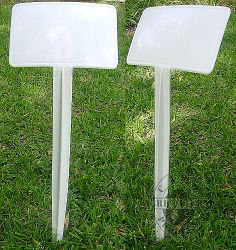 * Top of headerboard to point of stake = 430mm. This marker also has a header board that is angled backwards. It has a sturdy spike for pushing into the soil, re-inforced where it attaches to the header plate. 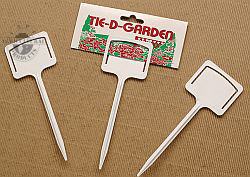 Use for marking plants, nursery rows, individual trees and many more. * Top of headerboard to point of stake = 260mm. This mini T-marker is ideal for marking seedling trays, plant pots and seed beds in the nursery environment, especially propagation nurseries. Also useful for marking rows in orchards or vineyards. * Top of headerboard to point of stake = 175mm. * This marker can be produced in various colours. This marker can be used for marking seed beds and areas where seeds or seedlings have been planted. The slit in the header plate makes it possible to place the seed packet in the groove for easy identification. When it is no longer required the packet can be removed and replaced. Information cards can also be placed in this slit when wanting to provide more information to the reader or customer. An example of this would be in a herb garden where you can produce a card giving the natural benefits of the herb concerned. This card can be laminated for weather resistance. 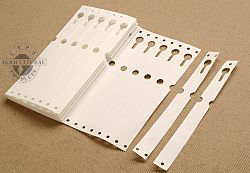 If required the header plate can also be used to record information with a marker pen or pencil. * Top of marker to point of stake = 180mm. These pot labels are a recent addition to our range of marking solutions and are ideal for marking seed beds, plant pots and seedling trays. Ideal for use in growing tunnels as the plastic is not affected by moisture. Easy and quick to use, write the required information on the pot labels with a marking pen or pencil and press the sharpened end into the soil. 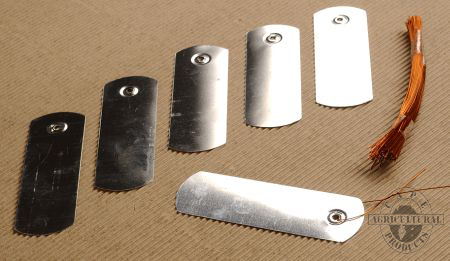 Reliable weatherproof tags are supplied with wire or copper ties. Easily embossed with product details using a ball point or permanent marking pen. * 75mm long x 25mm wide. Write on the label with a pen, marker or emboss it with a sharp object and you will have a clear, permanent inscription. Large enough to provide plenty of space for your message, which will remain legible for years in any environment. 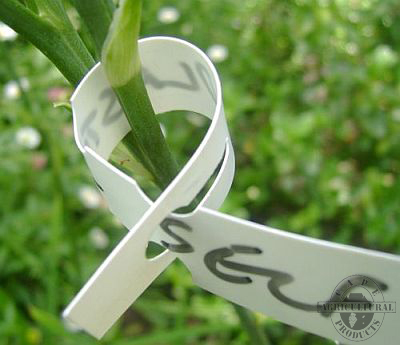 These labels are used for identifying and marking plants. Made from hard-wearing, durable, spun bonded polyethylene. Generally supplied in plain white but various colours are available on request. Labels can be pre-printed in up to 3 colours per side for personalisation. Very light, flexible and tear-resistant. Easy to attach, take around the plant and put tag through the pre-punched "keyhole"
Surface suitable for computer printer, pen, marking pens or pencil. * Size - 178 long x 19mm wide OR 180mm long x 21mm wide. * Colours available : White, Blue, Yellow, Light Green, Dark Green, Red, Pink, Purple, Orange, Brown, Grey.